-Teaching how to use the program, GIMP. Ex. 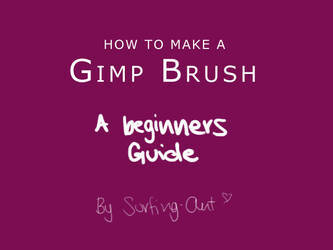 : GIMP tutorial for beginners, shortcuts for GIMP, etc. GIMP is just like any other image manipulation program like Photoshop, Coral Painter and Paint Tool SAI; the only difference is this program is free. Anyone can use GIMP no matter what the skill level. It is more complex than MS Paint by far but more simplistic than other programs making it easier to navigate and get use to. Things you can do with GIMP include photo manipulations, digital painting, inking, texture creating, text creating, and animating. There are a plethora of other tools including many types of blurring, an iWarp tool that works like the liquify tool on Photoshop and layer modes that make it easier to create your art. A mouse or tablet can be used in conjunction with the program and a mouse can be used in all cases- tablets aren't needed and can be circumvented for painting with the opacity setting on tools and layers. First of all, I plan for this information to be for those fairly new to GIMP. Some folks who have been using it for years will find it inane and obvious, but really those who have GIMP as their first digital art/editing program will most likely not know these things. Feel free to read though if you wanna say "Pfft, I knew that" throughout. 7. Then in the search box write "brushes"
8. Double click on the brushes folder, then drag your brushes from desktop to your brushes folder. 12. Click on the fuzzy circle brush and it will show all the brushes you have and should show the ones that you just downloaded.